LA: Known in Malian culture as Bògòlanfini, or Bogolan, West African Mud Cloth is an ancient practice that dates back hundreds of years. Traditionally, men weave the handmade cotton fabric and women dye it with fermented mud. Because every piece is handmade, each textile is one of a kind. The painted symbols tell different stories with their arrangement, color and shape, not unlike ancient Egyptian hieroglyphics. As makers that believe in handcrafted, one of a kind pieces, here at Mignonne we love the aesthetic that African Mud Cloth brings to our furniture! Displayed in Picture One is our 'MUD CLOTH' Chair, a 1920's antique slipper chair reupholstered with original African mud cloth, available now in our West Berkeley shop, Mignonne Decor. 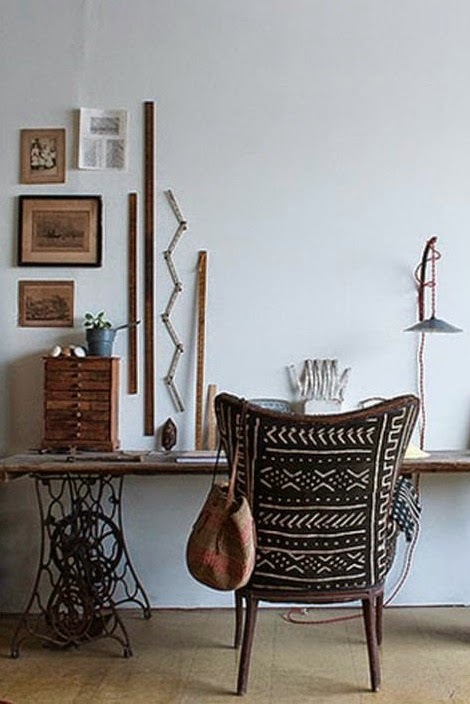 In Picture Two, a reupholstered mud cloth chair spotted in the studio of woodworker (and maker of many things) Ariele Alasko, whom we adore! This is a stunning example of integrating traditional West African patterns with a simplistic, modern interior. Here, the mud cloth provides an earthy, natural look that is eye catching and unique. Interested in having an African Mud Cloth of your own? 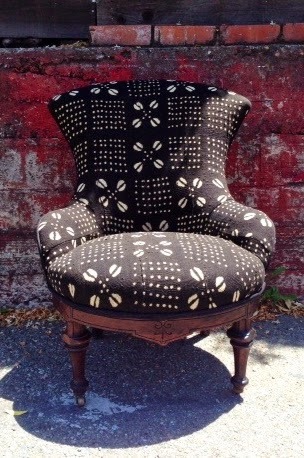 We can reupholster a piece you may already have, or check out our site for more transformation ideas. And email us at quotes@mignonnedecor.com to start a conversation about a project of your own.